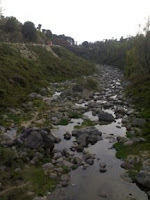 This time I thought I would not write - Its just a visit to my home town. 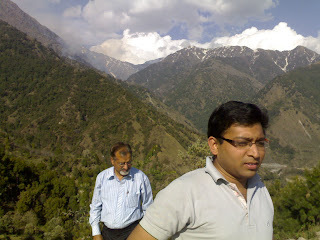 But yesterday one of the friends asked - "didn't see the update of your Himachal visit on your blog?" 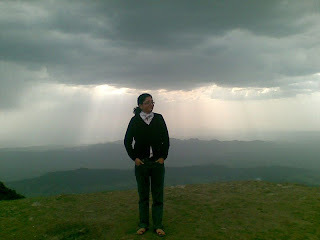 Hmm so people do look forward to my write ups... :-) So here's the post on my Himachal visit. The day we reached was Holi. There is the tradition of "Jhanki", tried a lot to get an appropriate English word for it but the exact feeling didn't come, the options I could think of were procession, fiesta, Carnival, Cavalcade and Convoy, thanks to Shuchi for helping. Language experts out there please suggest which is the nearest. So we all decided not to rest but to go out and be the part of celebrations. During the festival, locals come dressed in their best clothes and dance and sing joyously. They carry Gods dressed in finery, which are placed in colorful palanquins. It was fun more so because I was being a part of it after may be 15 years and others never saw it before, so was exciting for them, at least I would like to believe that :). After a tiring day of 9-10hrs of journey and the celebrations finally we got to rest at around 10pm. What a day it was! 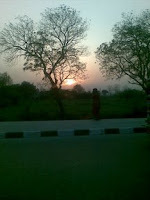 Morning...Good morning...we all woke up early to enjoy the quiet atmosphere, chilled air, sound of chirping birds and a beautiful sun rise. 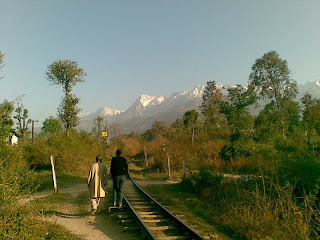 Thats my Palampur :) After a stroll around..in the garden, and the railway track nearby had garma garam home made aaloo paranthas with aam ka aachar and Dahi...yummm. Then had a small meeting to decide where to go. This time I gave strict instruction to papa to take me to some place I have not seen before...tough for him I thought but he came up with so many places, thats why he is my favorite. Love you Papa. 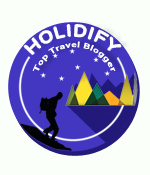 So we are going to Billing - Billing is a beautiful little place in Himachal, which is considered to be one of the best gliding sites in the world. 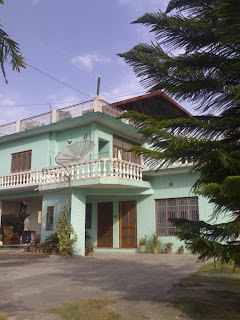 Located at an altitude of 8, 500 feet in Kangra valley, Billing is famous for hang-gliding. On the way we visited a monastery as well. Would not write much about the place Pictures speak, will add a few more later :) It was awesome! Simply Divine! While going back it started raining. 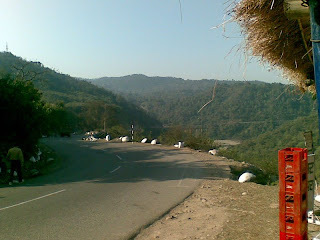 Wowwww...... :) Also visited my birth place Baijnath on the way back. Next day first half was spent in a "khud" playing in water and after lunch we went to "Jakhni Mata". A small temple at the top of a hill. 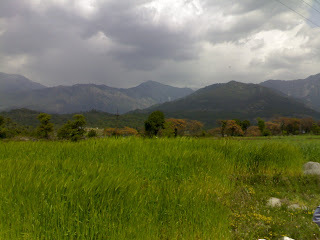 You can get beautiful view of Palampur and nearby villages from there. On the way back visited some old friends. I was treating all for Dinner as my B'day's approaching. Ohhh....we are going back the next day. Didn't even realize the visit's already over. We would be traveling the whole Monday. No break journey. Agni has accepted to drive the whole day, without breaks literally. This time he himself got the directions from papa, no help required from Shailza. So here we gooooooo................ooops....flat tyre. Just after an hour's journey got a flat tyre. The 3 men, is it?...mmm just one actually, worked hard to get it fixed. Stopped at one other place to have something, which was a samosa each. Tomorrow is my B'day. Reminded them all to get a surprise cake and gifts for me :) and they did! actually....reached home at 9pm. Had dinner and then party time at 12am....yay its my B'day! Then Agni starts with full force...Dhananjoy wants him to stop for Lunch...he goes on...Kum kum wants him to stop to get fresh...he goes on...and he goes on and on and on....till its 5 in the evening :) Ani and me as usual quiet observers...flexible can adjust to any situation types. Finally he stops at a place, that apparently Dhanu and Kum kum didn't like.They refuse to take anything...we had burgers. 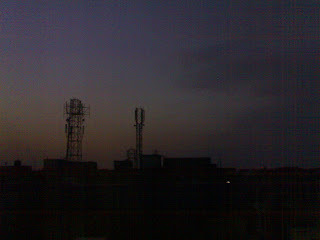 Finally touched Delhi at 7.00pm what Agni anticipated when we started.